Just three miles from downtown Seattle, a dynamic townhome project with five different models is taking shape. Sawtooth is within walking distance to Franklin High School, a home improvement center, banks, coffee shops, restaurants, a grocery, a pharmacy and two parks. 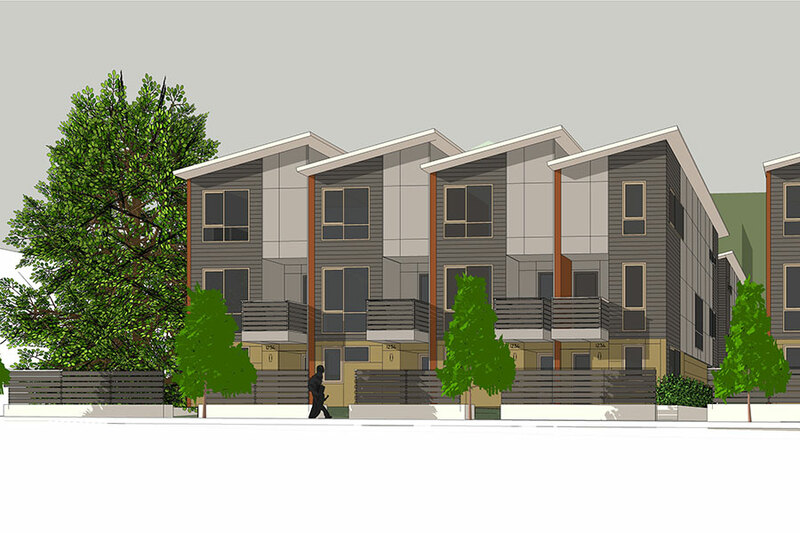 Located in the heart of the Rainier Valley where many of Seattle’s 340 sawmills were making lumber in 1900 is a new townhome project. Sawtooth is named and designed with roof forms recalling Seattle’s lumber heritage. The south facing sawtooth roofs have one foot in the past and the other in future – the roofs slope at an angle that would be perfect for each owner to add solar panels to their home. Sawtooth townhomes provide comfortable urban living, with no homeowner or condominium dues, only 3 miles from downtown Seattle in an established neighborhood. Inside, wide windows and sliding glass doors bring light into all living spaces. These private residences feature a great room on the main level with a full featured kitchen and dining for six. The open living room has a nice balcony, perfect for grilling and enjoying the outside. The top floor of each unit is a master suite with lots of storage, a nook, washer and dryer and a second bedroom and bath. Ground floor has a bedroom/study, half bath and a single car garage. Sawtooth is designed to Built Green standards, an environmental building program from the Master Builders Association in partnership with King County and Washington State government agencies. Including high efficiency water heaters, plumbing fixtures, and insulation, Sawtooth townhomes are more cost effective to own and will cost less to maintain. Beautiful bamboo floors, whole house ventilation, and low VOC paint and finishes will promote safer, healthier indoor-air quality and help you leave a smaller environmental footprint while helping to protect the Pacific Northwest’s precious resources. Your new home, is walking distance to Franklin High School, a home improvement center, banks, coffee shops, restaurants, a grocery and pharmacy. Cheasty and Lake People Parks are just steps away and Franklin Public Golf Course is a few blocks to the west. King County Metro bus service passes by every few minutes and in five minutes you can be at Mount Baker Light Rail Station, making it easy to get to downtown and SeaTac airport, both in about 20 minutes.